The Euro Technics Underpinners are ideal for precision and serial work in the frame shop. The fully-automatic models are easy and safe to operate. Each model offers an exclusive clamping system which pulls both parts of the frame firmly together and holds them tight on the working table for accurate nailing. They have adjustable corner supports which accommodate angles of 90-, 60-, 45- and 30-degrees. 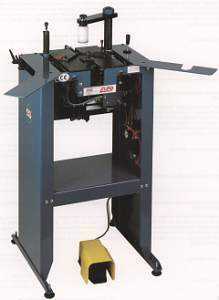 Additional features include unique pedal-operated clamping systems and mobile work tables for several wedge positions. The Model #9011 features a foot-controlled exclusive clamping system to pull both parts of the frame firmly together while holding them tight on the working table for accurate nailing. Easily adjustable corner supports accommodate angles of 90, 60, 45 and 30-degrees. Micro-adjustment knob corrects slightly miscut mitres. Grib for pneumatically shifting and blocking two preset nailing positions. Possibility to stack nails. Quickly fixed pressure pads, according to the height and profile of the moulding. Production switch. Silent compressor optionally available. Capacity: profiles of maximum 150 mm wide and 80 mm high. 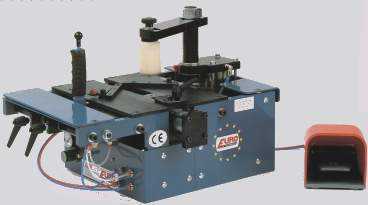 Technical data: air-operated machine with regulation knob for air pressure depending on the hardness of the wood. Dimensions: width, 560 mm; depth, 550 mm; height, 1230 mm. The Model #9012 has the same specifications as the #9011, except it is a fully automatic machine with preset positions to increase accuracy and production. The automatic Model #9009 features a foot-controlled exclusive clamping system which pulls both parts of the frame firmly together while securing them flat and tight on the work table for accurate nailing. Easily adjustable corner supports accommodate angles of 90, 60, 45, and 30-degrees. Fine adjustment control system corrects slight miscut mitres. 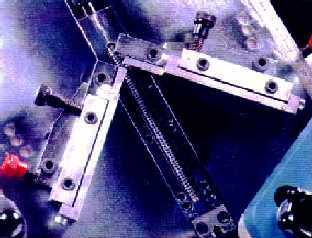 Nails can be driven from two preset positions without moving the frame or clamping system. Hand control adjust nailing positions to provide the possibility of repeat nailing. Safety measures are built in. Button to be operated with the second hand for completely safe working conditions. At the same time this button immobilizes the movable nailing unit at any point between both stops. Optional equipment includes a choice of several heads to meet the height and profile of the frame, a floor stand, and silent air compressor. Capacity: height, 4 inches (100 mm); width, 4-3/4 inches (120 mm. Technical Data: air operated max 140 psi with regulator knob. Dimensions: width, 23-5/8 inches (600 mm); depth, 15-3/4 inches (400 mm); height, 15-3/4 inches (400 mm). 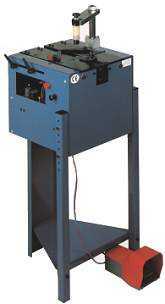 Also available is the Model 9009 JKS 6" capacity. NEW PLATE AVAILABLE TO ACCEPT & NAIL 6" WIDE MOULDING. The Model #9005 has a unique pedal-operated clamping system: the frame sections are pressed firmly to each other and kept that way steady on the work table. Self-adjusting pressure pad. Several pressure pads are available for different materials and profiles. Adjustable fence for angles of 90, 60, 45, and 30-degrees. Mobile work table for several wedge positions. Possibility of stacking wedges. Stand included. Compressor optional. Adjustable pressure, speed regulator and button to unblock. Safety: Easy to use and conforms to safety regulations. 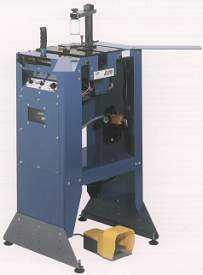 Capacity: All profiles up to 3-1/2 inches (90 mm) high and 5-1/3 inches (135 mm) wide. Dimensions (front): width, 50 cm; depth, 42 cm; height, adjustable stand from 92 to 101 cm. The Model #9006 has the same features as the Model 9005, with the exception that it has a button for serial work (clamping and joining in one step).